Last week, the CUNY Graduate School of Public Health and Health Policy was delighted to host Lawrence O. Gostin, JD, LLD as part of the Health Policy and Management lecture series. 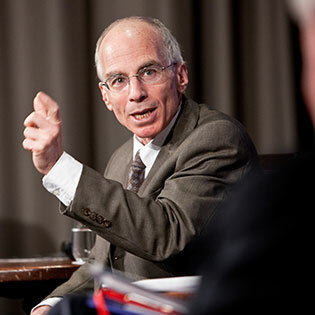 Gostin is an internationally distinguished scholar on global health who serves as Faculty Director and Founding Chair at the O’Neill Institute for National and Global Health Law at Georgetown University. In his talk Thursday, Imagining Global Health with Justice, Gostin emphasized the need for effective global governance for health and offered a blueprint for reform, based on the principle that the opportunity to live a healthy life is a basic human right. To achieve global health with justice, Gostin said, major reforms of global health institutions and governments are needed to ensure better coordination, more transparency, and accountability. He illustrated the power of global health law with examples of case studies on AIDS, influenza, tobacco, and health worker migration. Gostin said that CUNY SPH was the perfect place to host his talk, given the School’s mission to promote and sustain healthier populations around the world and to shape policy and practice in public health for all.